As the host broadcaster, BBC has the best studio location. Located at the Olympic Park, BBC’s primary studio is constructed on top of a temporary structure, a short walk from Olympic Stadium. Unlike the NBC set, this one focuses solely on the view, with a fairly minimal design. Rings semicircle the anchor area with LED lighting running throughout. 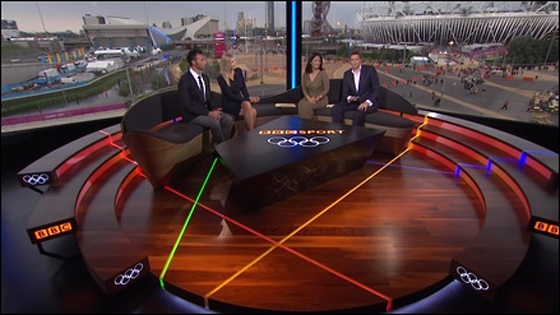 BBC logos and Olympic rings appear on the ends of the rings, and above the windows. Anchors sit on oddly shaped furniture, that doesn’t really look that comfortable. The one good part is the size. The couch can hold up to six people at a time. In front of the anchors is a large coffee table that has different tops, depending on the broadcast. Unforunately, the anchors dumps papers on it, mucking up the branding. 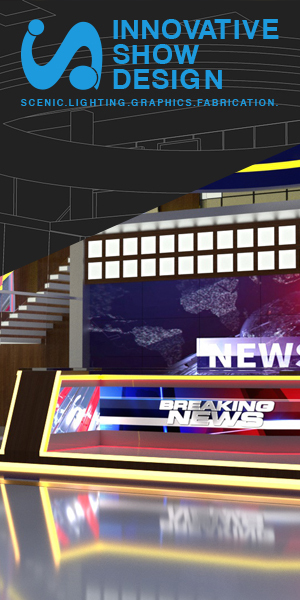 This studio is a stark contrast to the NBC broadcast, which uses regal elements and big screens to anchor its studio.